How do you choose the best agenda suite for your Corp. strategy? 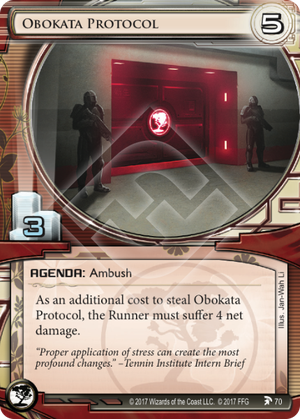 One of the things I like best about Netrunner is how even basic game concepts can have incredible strategic depth, and even small choices can make huge impacts on the way you play the game. This is a tricky new deck made possible by the printing of Reconstruction Contract in Sovereign Sight. The goal is to use Contract with Dedication Ceremony to score agendas out of hand. With just those two cards you can score any 3-advancement agenda from hand. 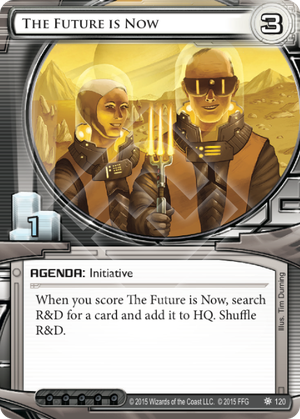 If the Contract (or the agenda) was in play for a turn, you can actually score any 4-advancement agendas from hand. Even crazier, if you get a single advancement counter on the Contract, then you can score a 5-advancement agenda and the Runner won’t be able to challenge it. For my first draft listed above, the agenda suite was chosen to maximize the ability to leverage this combo. 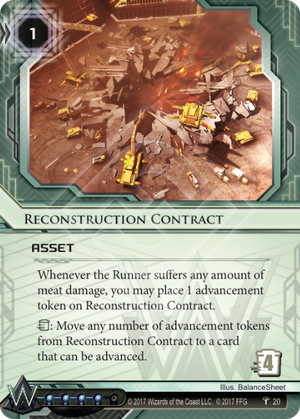 Six of the eight agendas in the deck can be scored without having to land a single bit of meat damage. And the deck just kept losing. I ran into the classic Weyland trap – I could score six points, but I couldn’t figure out how to get the winning agenda. By the time I had scored six, the Runner was able to camp my remotes, pound my centrals, and had an econ engine that blocked any potential scoring window I tried to open. I liked my ICE suite enough. I had some high-impact assets that were forcing Runner through my servers. My economy was more than functional. And my agenda density was so low that I would constantly dodge powered-up Deep Data Minings. 2 + 2 + 2 + 2 = LOSE! 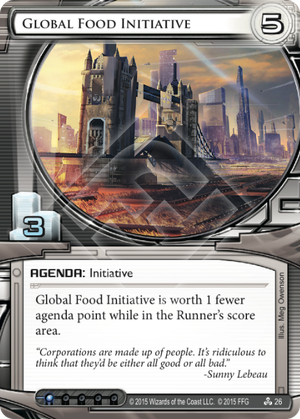 The Corp’s goal in Netrunner is to score seven agenda points. But how much consideration do you give to which agendas you score, and when you score them? Look at my deck above, what is the best path for scoring seven points in that configuration? It is probably trying to chain Project Atlases with counters, and then trying to get an Oaktown through. Do you see the problem with that? The first issue is that it isn’t an efficient scoring plan. 2 + 2 + 2 + 2 = 8. Even worse, this plan means you need to score all of your agendas as 4/2s. And finally, to win, I had to score a full four agendas – that 50% of the agendas in the deck. There’s another potential scoring plan where I score two 2-pointers, then close out with a Global Food. This is a lot better as we need three agendas, compared to four, and we’re scoring an efficient seven points rather than eight. But it turned out that this plan was nearly impossible. With only two Global Foods in the deck, I never got one on the table with enough tempo to score it – even with a Red Planet Couriers. In each of these cases, not only are you scoring more points that you need to win, you’re also wasting clicks and credits, and giving the Runner the opportunity to take control of their natural dominance the Phase III. When you understand your scoring pattern, you can make better tactical decisions about what order to score in, how many resources to devote to any given score, and importantly, when you can sacrifice an agenda to tax the runner and open a better scoring window for yourself. This mix was immediately more successful. First off, it transformed my primary scoring plan. Instead of trying to force through four (effectively) 4/2s, I could score a 3/2, a 4/2, and a 5/3 with pretty decent regularity. The one-off Hostile Takeover also gave me the option for two other potential efficient patterns (3 + 3 + 1 and 2 + 2 + 2 + 1) that could be closed out from hand. Mostly, I could win by scoring three agendas, instead of four. And I could take risks by bluffing and baiting with agendas that I didn’t need anymore. 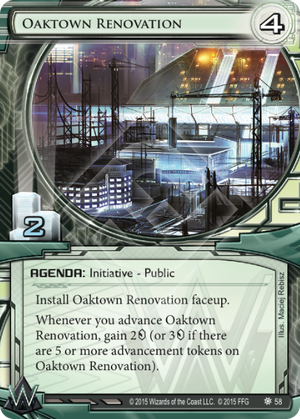 For example, if I had already scored two Project Atlases (with tokens or not), then I was very willing to install-advance-advance and Oaktown just to get the runner to waste credits trying to steal it. On top of of it all, this configuration still kept a lot of the benefits of the initial set up when it came to dictating the Runner’s scoring patterns. The Runner still had to steal 50% of the agendas in the deck to win AND the density was so low that more than 80% of the random accesses should miss. While this setup was much more successful, I think it was only because the core of this deck was Fast Advance combo. A more mid-range or Glacier deck could run into some issues with this mix – because the density is so low. Most players have a basic understanding of agenda density. The basic idea boils down to this: the more agendas in the deck, the higher the likelihood that the Runner will hit one when they get an access on HQ or R&D. If you remember our earlier article on Runner archetypes, you’ll know that decks are constructed assuming an average value per run, and runner have to make tactical and strategic decisions to maximize the value of their runs. But the Corp can influence the average run value with their agenda selection. For example, if we assume the average Corp deck is made up of 20% agendas, what happens to the average run when the Corp deck only has an 18% agenda composition? In this case individual runs become less valuable! The other lever Corps have is the point value of their agendas. If every agenda is worth three points, you might have fewer in your deck, but the Runner needs to score fewer of them to win. These two mechanisms tend to balance each other out, but they also help define the tempo of the game. 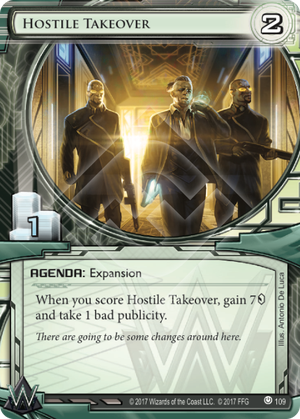 If your deck has a low agenda density, it means that the Runner will see fewer agendas per turn than typical – but that is also true for the Corp too. This strings out games.. That’s one of the reasons the Builder of Nations deck above had so much difficulty closing out. It wasn’t seeing enough agendas to rush, so it was letting the Runner set up into the late game. Sometimes, however, this is exactly what you want. If, as the Corp player, you want to build for Stage III dominance, low agenda density is exactly what you want. You want to make it possible to score out a small number of high-value agendas, but you also have to set up your semi-soft locks to keep the Runner out. This is a pretty powerful suite of agendas. Each card in here has the ability to dictate the course of the game. Scoring a single Nisei makes it almost trivial to score your next agenda. Philotic often just wins games – and it’s still an efficient 3/2 when it doesn’t. And Obokata is restricted because it is strong enough to dictate strategies around itself. You could do worse than to take this configuration into a match. But you could also do better. We do have a higher agenda density with this set up, but we also gain a significantly better scoring plan. Based on our deck, we are going to score two Obokatas and a single 3/1. 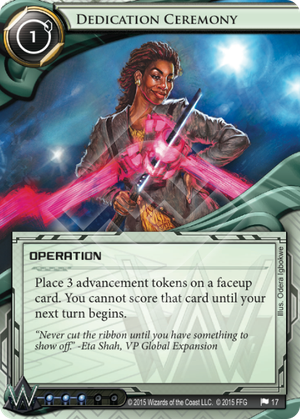 We’d prefer that 3/1 to be House of Knives because it augments our lock, but if it is a The Future is Now, we can use that to rebuild our economy, or grab a necessary combo piece. We are also dictating the Runner’s scoring pattern is a major way. In the original suite, a Runner could score a couple Niseis or the Philotic, and then ignore our ID ability when they went to score the winning Obokata. The new configuration doesn’t allow for that. You’d have to score almost all of the 3/1s before you found yourself in the same position. Now it’s your turn. How do you construct your agenda suites? 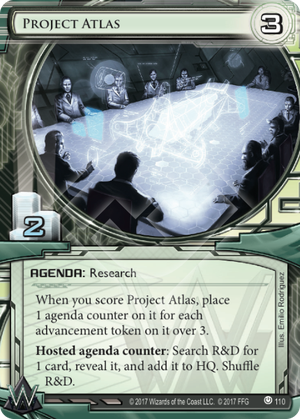 What underplayed agendas have you found to be secret tech?